Azusa is the King of Jurai, and he appears to have been in reign for quite a long time. Nothing is known of who his parents were, though they were obviously part of the Royal Family. Azusa appears to be very gruff and sometimes a bit too mean when he's handling his children, but he really does care very very much for Sasami and Ayeka. Azusa actually has a big soft spot, as he seems to like little Ryo-Oh-Ki. Asuza has two wives, Funaho and Misaki, who are the first and second queens of Jurai. Azusa has three children; Sasami, Ayeka, and Yosho. Funaho is the first queen of Jurai, and the mother to Yosho Jurai. Funaho is very calm and serene. She is also very polite. She seems like the sort that would like very much to sit down and have some tea. Funaho rarely looses her temper or freaks out like Misaki! In the Anime, Funaho is never really shown using her powers, but in the manga it is obvious that Funaho is a very powerful Jurain, even though she was raised on Earth. Yes, Funaho is an Earthling who married a Royal Jurain family member- the king, Azusa. Thus, Lady Funaho adapted to the Jurain life and even gained the powers of a true Jurain! Misaki is the second queen of Jurai. Unlike Funaho, Misaki is a full Jurain. With Azusa, Misaki had two children; Sasami and Ayeka. Misaki cares a lot about her children. Unlike Funaho, Misaki is very energetic, and very....well.... bouncy. She absolutely loves anything cute. (Especially Ryo-Oh-Ki!) Misaki also has a tendancy to embarass Ayeka, whether is be forcing her to call Misaki "Mommy" or bringing out an old holo album containing a picture of Ayeka after she wetted her bed! Misaki loves Ayeka, but of course she loves her "baby", Sasami, and wouldn't stop hugging her when Misaki and Funaho came down to Earth. ^_^;; Misaki is probably just as powerful as Funaho, though she is never seen bringing out these powers in the manga or the anime. However, Misaki is seen bringing power from the twin trees of Jurai down to the Earth's trees! Ayeka is Queen Misaki and King Azusa's first-born daughter, thus the first crown princess of Jurai. She is also Sasami's sister. Ayeka tries desperatley to be "lady-like" on Earth, but it always fails because she falls victim to the need to fight with Ryoko. Ayeka is essentially in love with Tenchi Masaki, as her half-brother Yosho is a lot older-looking than Ayeka had hoped when she finally found him. Ayeka was betrothed to Yosho, however he had to leave Jurai when he fought the demon Ryoko, which eventually brought him to Earth. Ayeka searched for Yosho, which took her 700 years. (Though she still looks the same as she was 700 years ago because she was asleep on her ship until awakened when she reached Earth.) Ayeka is quite a witch sometimes, and fight with Ryoko consistently! Sometimes I get the feeling that Ryoko is just playing with Ayeka, but Ayeka takes the bait and fights. Ayeka is very much in love with Tenchi, which makes her extremely possesive of him. 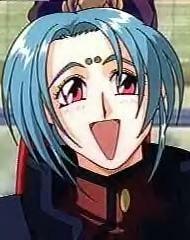 Ayeka feels that Tenchi is meant for her, and for her alone. Achika Masaki is the only child born to Katsuhito (Yosho) Masaki and Itsuki Masaki. Though Itsuki was an Earthling, Achika still has Jurain powers. 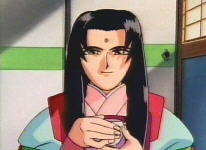 (As seen in Tenchi Muyo in Love 1) When Achika was in high school, she met a shy young man named Nobuyuki. (Yes, the perverted old man that we know today....) Achika had a crush on him, and made him promise that when he built the house that he drew pictures of, that he would take Achika to it. Well, of course Achika saw it because Nobuyuki married her! Unfortunatley, when Achika used her Jurain powers to fight the evil KAIN, her life span was shortened and she died only a few years after Tenchi Masaki's birth. (When he was just a tiny child.) However, Achika had a very, very happy life living with Nobuyuki in the house that they had built together. Achika was very kind and lively, and also very beautiful, with long, midnight black hair. Tenchi Masaki is, yes, the (rather unfortunate) hero of our story who happens to be forced into everything that goes on in his household. Tenchi never asked for a handful of alien women to come into his house! 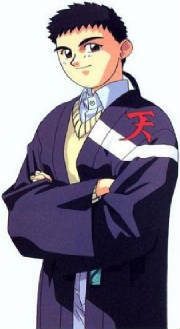 Tenchi is the son of Achika and Nobuyuki, and the grandson of Yosho Jurai. (Also, the great-grandson of Azusa, king of Jurai!) Tenchi actually seems to handle the women who just sort of show up at his front door very well. He doesn't just push them out into the street like most people would! 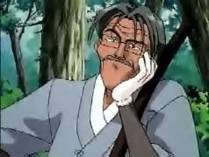 All of the girls seem to be attracted to Tenchi, so he must be a pretty nice guy I guess! 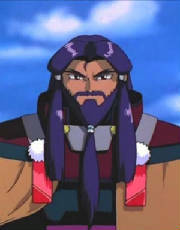 Tenchi, being the grandson of Yosho, has much Jurain power and is able to use the sacred "Light Hawk Wings." Tenchi has defeated countless enemies, and proves to be worthy of his Jurain power.